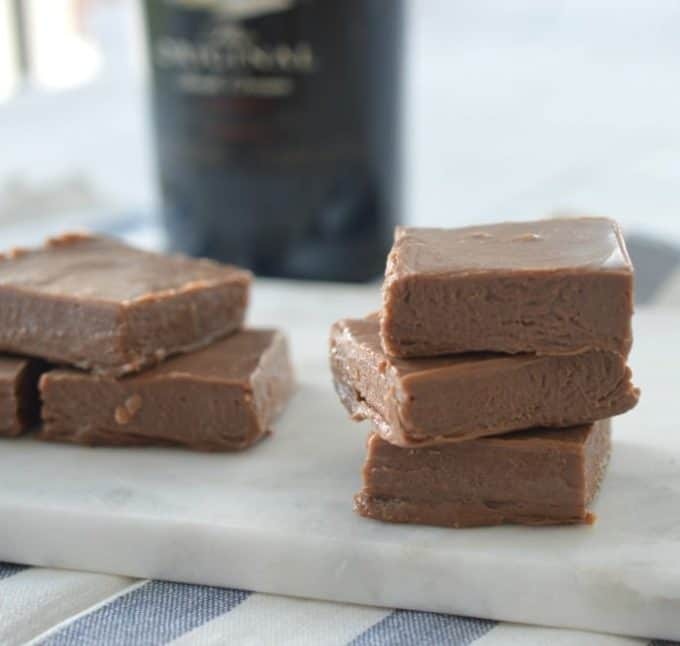 I have a feeling you are going to LOVE this 3 Ingredient Chocolate Baileys Fudge!! This Baileys Fudge recipe is my second experiment with the MASSIVE bottle of Baileys my husband bought back for me from duty free, and after the success of my Baileys Chocolate Brownies, I couldn’t wait to try adding Baileys to my favourite Chocolate Fudge recipe. This recipe could not be any easier to put together, and while you do need to wait a little while (overnight) before you can enjoy the results (that is unless you lick the bowl!!) I promise you it’s totally worth it! It took every inch of my self control to just take one small bite of this fudge (I’m still breastfeeding) and it’s certainly going to go straight to the top of my must make list when our little guy is older! This isn’t your ‘traditional’ hard fudge as it has a softer consistency, which makes it really important to let your fudge set overnight before cutting it into small (or large, there’s no judgement here!) pieces. It’s also important to use a good quality condensed milk for this recipe (I normally use nestle) as some brands can impact on how well the fudge sets. As well as being a great dessert or sweet treat, this 3 Ingredient Chocolate Baileys Fudge also makes a great homemade gift and is perfect for easter or christmas gifts! Line a 20cm square cake tin with baking paper – it’s important to make sure that you leave plenty of paper hanging over the sides to help you remove the Chocolate Baileys Fudge once it has set. Heat a medium saucepan over a low heat and add the condensed milk and the milk chocolate – which has been broken into squares. Stir regularly until the chocolate has melted and the ingredients have combined - around 8 minutes. Add the Baileys and stir for a further 2 minutes until the Baileys is well combined. Remove the saucepan from the heat and pour the fudge into the prepared tin and place in the fridge for a overnight (12 hours) to set. 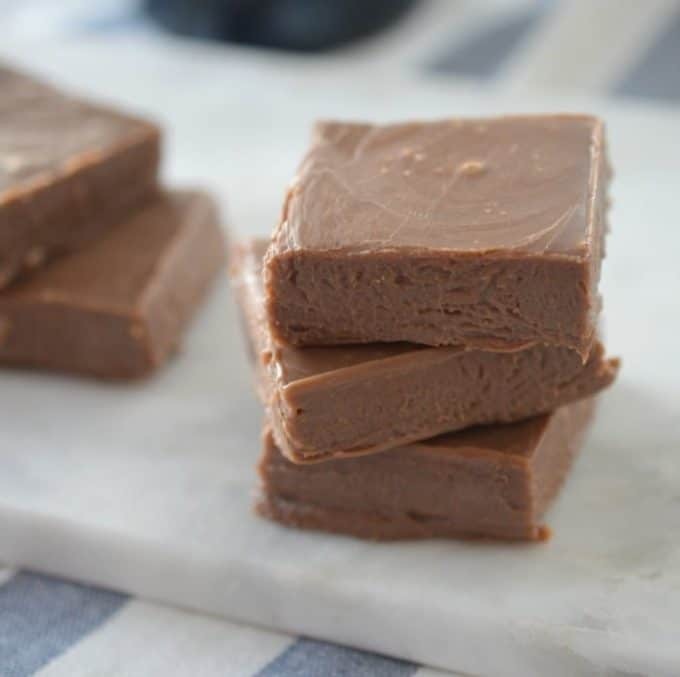 Remove the set fudge from the fridge and cut into squares. It's important to use a good quality condensed milk (I use Nestle) when making this fudge to ensure it sets. Please note this isn't a traditional hard fudge and it does have a soft consistency. Break the milk chocolate into pieces and place it into your Thermomix bowl. Add the Baileys and cook for a further 2 minutes, 100 degrees on speed 3. Working quickly, pour the fudge into the prepared pan and place it into the fridge overnight to set. OMG! I am so making this for Christmas. Home made gifts sorted!! Would you store this in the fridge or can it stay out? How long will the fudge keep for if kept in the fridge? Can you use a different liqueur for this recipe. Do you use eating or cooking chocolate? The caramel fudge won’t firm up, even tried freezing….what did I do wrong? Hi Jan, is it my caramel fudge recipe you are making or this Baileys Fudge? Is it still liquid? If so, I’d suggest cooking it for a little longer. Also did you use sweetened condensed milk and not evaporated milk? It’s the caramel fudge I’m having problems with, and yes I used sweetened condensed milk. I’ve had it in the freezer for 2 days and it’s still too soft to cut. Any suggestions? By the way, I used Kahlua in the baileys recipe and it is very nice, also added a bit of coffee powder to increase the taste. It has set quite well too. Hello…… I made the Bailey’s fudge but it doesn’t really taste like Bailey’s. Any ideas??? I used the real stuff…. Could you use dark chocolate instead of milk in the Baileys fudge?